The tan 1978 Batavus Regency bike is available to be re-conditioned or fully restored. This is one of our most favorite models of mopeds because of the soft, comfortable ride and fun Laura M56 reed-valve engine. The Laura M56 engine was only available in the Regency model so it is a bit more unique and rare than the standard issued Laura M48 engine that most Batavus mopeds used as a powerplant. It has a unique sound and feel when riding that is unlike most other bikes. The full seat position over the rear wheel allows the rider to easily control the balancing point of the entire moped by simply by shifting his or her weight forward or backward. This makes the entire bike feel very controllable and also very light. Though it is no taller in stature than other mopeds, it seems to fit many taller riders more adequately due to riding postion possibilities. Another really cool and unique feature that the Regency has is a 3 gallon gas tank. That is huge by moped standards. You can go a long ways on 3 gallons of gas in this bike! Batavus mopeds were built and imported from Holland and have always had a good reputation for quality. The Batavus engines are very solid but there is a limited amount of off-the-shelf performance parts available to them making these better suited for those looking for a stock ride. This moped could be purchased as a reconditioned moped but really would be best fully restored. For restoration, you can choose between having it painted in either factory Black, Tan or Red. Looking for a matched pair for a riding partner? 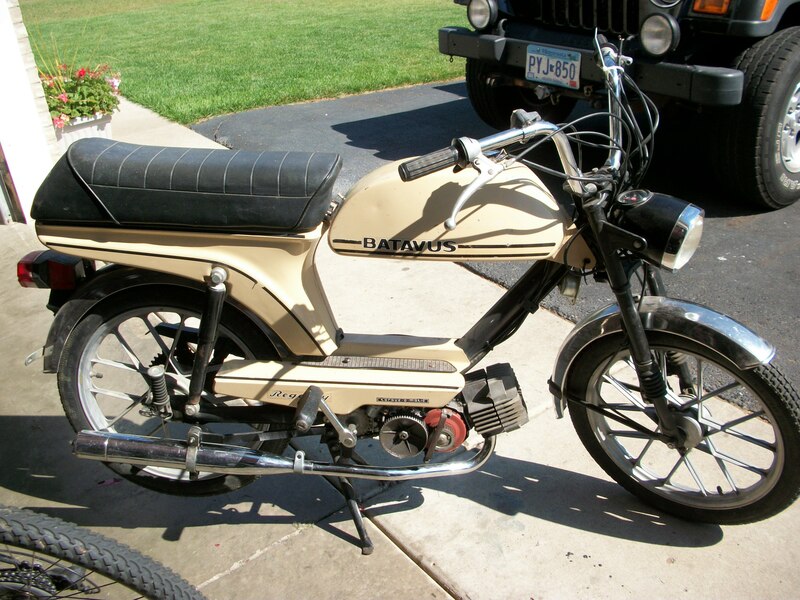 We have another 1980 Batavus Regency identical to this one that could also be yours! Not that you will need it but it will come with our 30 day warranty! Here is a Black re-conditioned one that went to a new home last year. We missed it so much that we actually tried to buy it back later on that same summer without luck! This moped is available to be shipped to most cities and states.